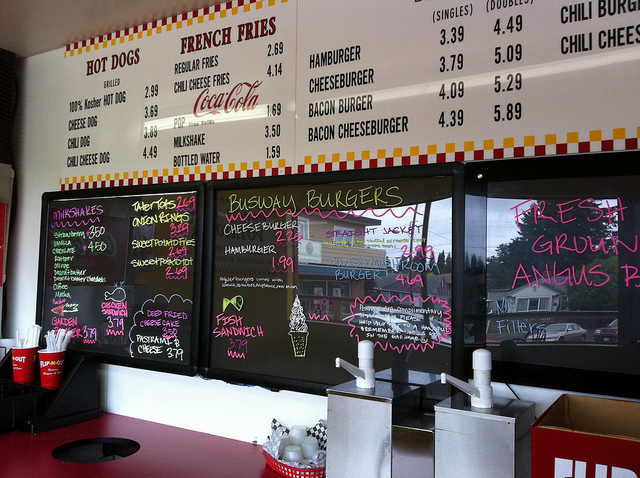 Flipping Out Burgers at 4008 S 12th St., Tacoma, WA 98405 has these amazing burgers! They are large, tasty and rather messy. Dear husband and I stopped and had a regular cheeseburger with fries and a mushroom swiss burger for lunch. Neither of us finished. My only regret is that I forgot about their sweet potato fries! Their food is good, their service is fine and their decor is cheerful, but simple. But really, we went for the burgers, not the decor. 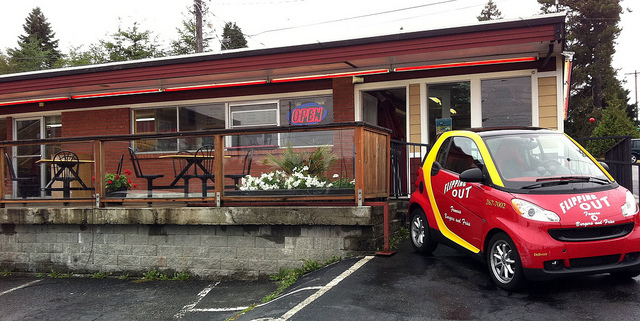 Also, they deliver in that darling little smart car! This entry was posted in Coffee Shops, cafes and bistros, Restaurants, Tacoma, Take Out, WA State - Pierce County on September 18, 2011 by admin.